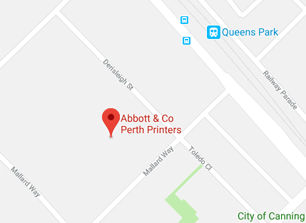 Abbott & Co Perth Printers is an Australian owned multi award-winning print company with more than 79 years’ experience in the printing industry. Abbott & Co Printers take pride in producing the highest quality printing and customer service, with numerous industry and environmental awards. To receive a quote, simply complete our enquiry form and a customer representative from Abbott & Co Printers will be in contact as soon as possible.